Weezer fans were not excited about the upcoming album after the single “Feels Like Summer” came out in March, due to the band’s new radio-pop sound. Last Friday, California-based rock band Weezer released their 11th album, “Pacific Daydream.” Fans have been anticipating — or rather dreading — this new installment in Weezer’s discography since the first single “Feels Like Summer” was released back in March. Weezer and its frontman Rivers Cuomo have a tumultuous history; the bands first two albums released in the 90’s are recognized as some of the best rock albums of the decade. After that, however, its output has ranged from pretty good to really bad. Its most recent two albums, “Everything Will be Alright in the End” and the “White Album” fell on the “pretty good” side of the spectrum, so fans had been expecting a return to form for Cuomo. After the 2016 release of the beach-infused “White Album,” Cuomo announced the forthcoming “Black Album,” which fans speculated would draw on the band’s earlier, angstier sounds. However, with this year’s release of “Feels Like Summer” and the subsequent announcement of “Pacific Daydream,” fans prepared to be let down again. It appears that Weezer learned the wrong lessons from the success of the “White Album.” “Feels Like Summer” takes beach-themed pop rock to the extreme. With a repetitive chorus, loud electric guitars and generic lyrics, the song seems like an attempt to get a radio-hit rather than anything substantial. Unfortunately, a lot of the rest of the songs on the album follow a similar path leading to “Pacific Daydream” almost sounding formulaic. The other side of this coin is that the album is incredibly focused and thematic. Thus “Pacific Daydream” raises the question: is the music bad in-and-of itself or was the album just a failed concept to begin with? All things considered, Weezer actually accomplishes what it was attempting quite well. Each of the ten songs on “Pacific Daydream” is glitzy, catchy and at least somewhat exciting. With this style, however, Weezer rejects both the sense of angst of its first two albums and the forlornness of the “White Album,” emphasizing radio candy instead. “Pacific Daydream” finds some semblance of redemption towards the second half. Songs like “Weekend Woman,” “QB Blitz” and “Sweet Mary” pay more tasteful homage to the California sound and don’t sacrifice as much lyrically as the earlier tracks. They also have a lot more personality than the generic “Feels Like Summer”-type songs. By no means as emotional as some of Weezer’s earlier work, they still create a sense of loneliness and heartache. 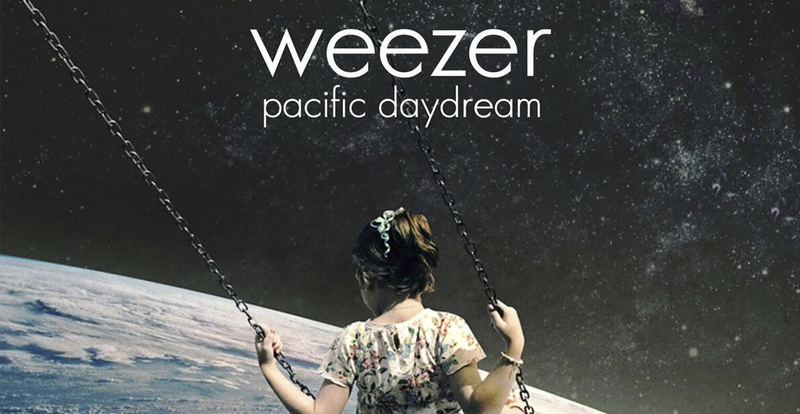 Overall, “Pacific Daydream” is an unremarkable piece of Weezer’s discography. Despite being a highly focused and concise album, it fails to really stand out on its own. Because of its heavy beach themes and short run-time, it seems more like a postlude to the “White Album” rather than its own chapter in Weezer history. Its focus, however, isn’t a major drawback of the album. The cohesive theme actually makes the glitzy pop sound more forgivable. While not special in any sense of the word, this album is also not terrible, and Weezer albums can certainly be terrible (see “Raditude”). Some fans will definitely be angry or say that Weezer has once again sold out, but I believe there is still reason for hope regarding the “Black Album.” Weezer may have lost its iconic angst, but there are still moments of irony and discontent in “Pacific Daydream.” Even as he tries to create radio-friendly pop songs, Cuomo acknowledges, “Everyone wants to be cooler than everyone else / it’s a hip-hop world.” Let’s just hope that doesn’t mean he’ll collaborate with Lil Wayne again.